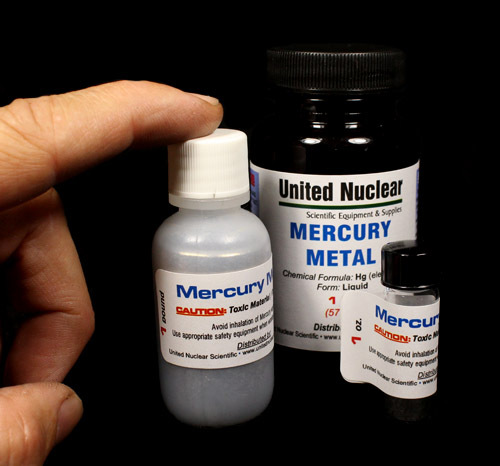 High purity (ACS/Reagent grade) Mercury metal. Mercury is a chemical element; atomic number 80. It is a heavy, silver liquid metal that is a fair conductor of electricity, but a poor conductor of heat. Mercury dissolves many other metals such as gold and silver to form amalgams. Pure Mercury, as well as its compounds are toxic. It has a wide variety of industrial uses from batteries & thermometers to nuclear reactors, sealed electrical discharge tubes and vacuum apparatus. It is also used in a variety of chemistry and physics experiments. Available in 2 oz, 4 oz, 8 oz and 1 pound (0.98 pound) containers. NOTE: Shipping regulations require we ship less than 1 pound of Mercury per box, so our '1 pound' container actually weighs a hair under a pound. Select size below. Caution: Mercury metal and its vapors are toxic. Use normal safety precautions (wear a filter mask/respirator and gloves) when working with Mercury and its compounds.